Traditional America-land potato salad is something I always avoided at picnics growing up. Gloopy, mayo-saturated, oddly sweet, purchased from the grocery store deli counter, sitting in the sun for ages – it never did it for me. Luckily my Mom would use a vinegar-based dressing whenever she made potato or pasta salads – so much better! 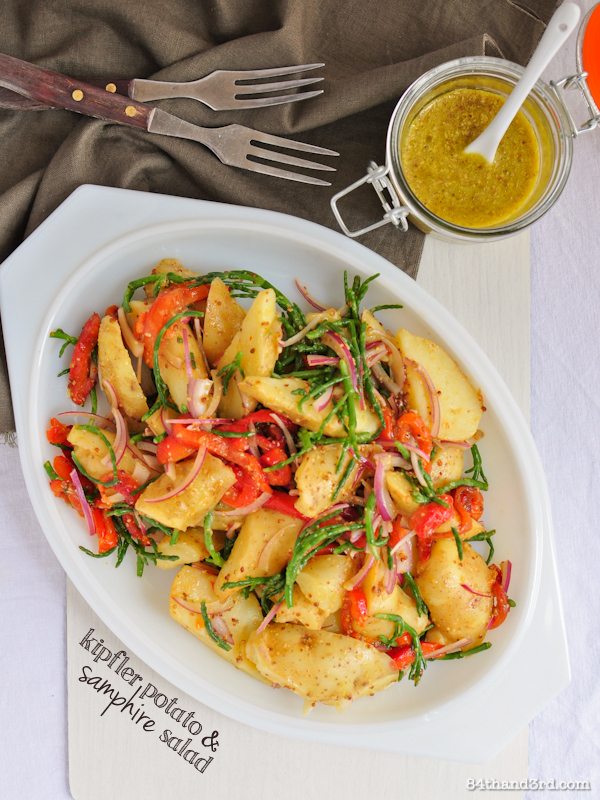 Now salt and potatoes go hand-in-hand, so when thinking about what to do with the crisp and salty samphire I received in a goodie bag a while back it just made sense to pair it with buttery kipfler potatoes and a tangy mustard dressing for a light potato salad. Samphire, also known as sea asparagus, is a coastal native succulent that grows in marshes and rocky areas near the sea. It’s been prized in the UK for ages and in recent years has become popular in Australia. 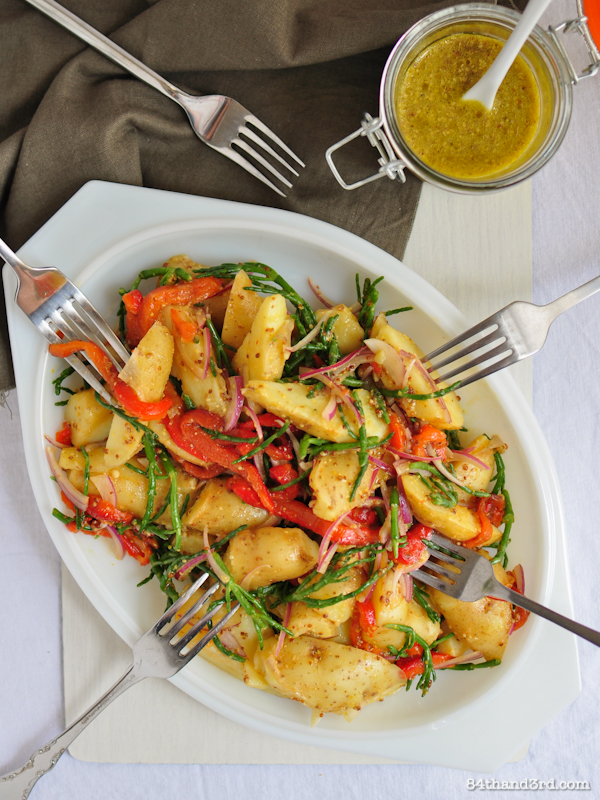 Samphire has a crisp salty bite and can be substituted with tender-crisp blanched green beans or asparagus. Some people steam it before eating but it is fine raw too, just give it a rinse in cool water first and snap off any woody bits. 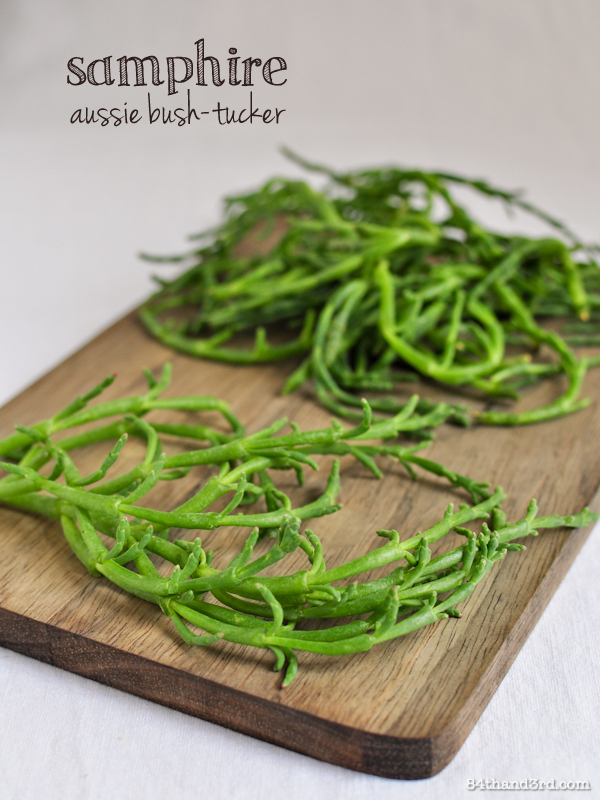 [UPDATE] Samphire is traditionally harvested in summer – told you this was from the archives – and while generally sold wholesale to the restaurant trade it can be found in some Farmers’ Markets around Sydney. 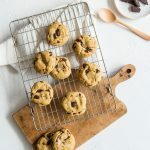 Although you’d never know it from my Instagram feed I’ve been exercising stunning restraint lately to stop making and photographing new recipes until I get through a bit of the backlog on my computer. When Claire from Claire K Creations asked me to guest-post while she is over in NYC on holiday I knew this was the perfect thing to share. 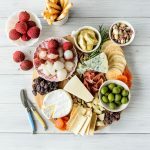 A little bit of Australian bush-tucker and a little bit of America-land picnic inspiration all rolled up into a fabulously versatile salad. Claire is one of those people, again, who I met on Twitter due to our shared love of food. Then at a conference last year we finally met in person – though only long enough to say hello. 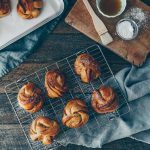 I do wish we lived in the same city, however I do have a feeling we’d plan far too many tea and cake dates that would result in needing to then shop for pants in larger sizes…! I’d never heard of it either until just recently, it’s lovely stuff! Thanks Anna 🙂 It is more a summer harvest but the seasons have been so random this year who knows! I have eaten samphire and seen quite a lot used on the Oz TV but have yet to succeed accessing it: perchance this post will make me try harder. 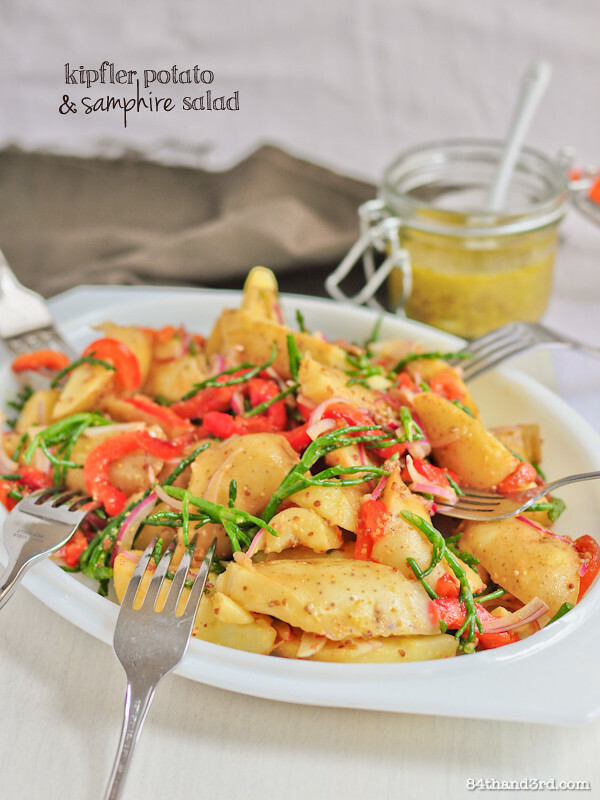 I am not a ‘potato person’ but this salad is most interesting and will certainbly get a try 🙂 ! Now this is my kind of potato salad! I don’t like the ones drenched in mayo either. 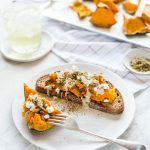 Like you, I’m not a fan of the mayo-saturated potato salad – but I’m loving the look of yours! I totally agree with you about the traditional American potato salad, but this looks fantastic! ive never had sea asparagus! this looks so cool! cant wait to hunt some down myself! I never made potato salad before, but i think yours look great! I love finding inspired new recipes for potato salads. This one is fantastic! 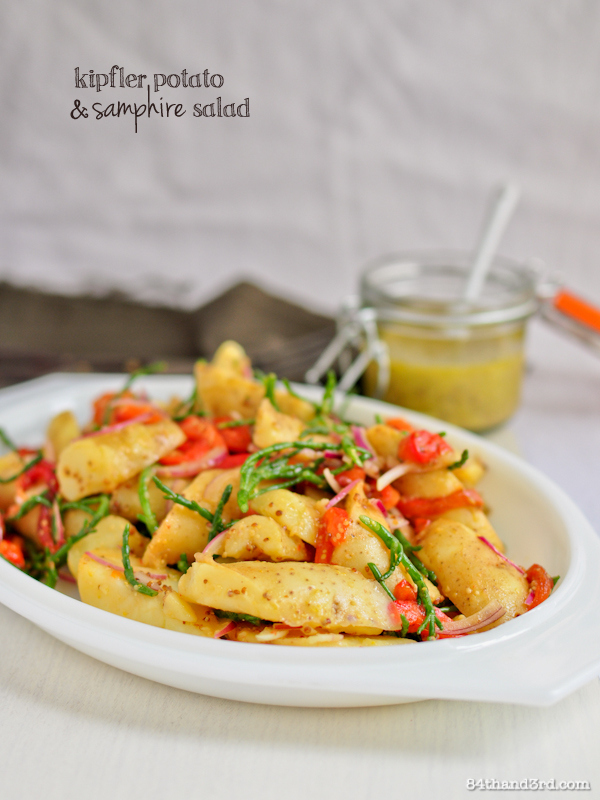 Samphire is a wonderful addition. Looks beautiful!